Earth Eagle Brewings is located in Downtown Portsmouth at 165 High Street and they are making some great beer. 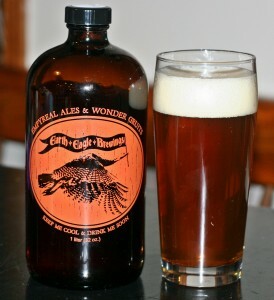 I recently attended the Seacoast Winter Brew Fest and Earth Eagle seemed to be a big hit. They were serving up 3 different beers at the fest and all were excellent. I had this one prior to the fest and brought back a couple of 32 ounce growlers for friends here in Maine. Every agreed this is solid IPA. This is not a big DIPA with high ABV or huge fruity notes, it is just a straight up IPA that is very tasty. The beer pours a nice orange color with solid two finger white head. Aroma is minimal compared to the big IPAs I usually drink but it is slightly sweet, fruity and very pleasant. Taste is straight up IPA with a solid hop profile, well balanced out and a nice clean finish. This beer is not going to shock anyone but it is a very solid IPA and it is fresh as the only way you can get Earth Eagle beers is straight from the brewery. I really like what Alex and Butch are doing with Earth Eagle and if you have not made the trip to Portsmouth to try some of their beer you are missing out.